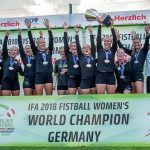 Switzerland and defending champion Germany have advanced to the final of the IFA 2018 Fistball Women’s World Championship. In two exciting semi-final matches over five sets, the Swiss squad beat host Austria 3:2, and defending champion Germany won against Brazil. In a re-match of the 2016 final, defending champion Germany and Brazil played for the second final spot in the 2018 Women’s World Championship. The fans in the ÖBV arena, on TV and livestream witnessed again a fantastic fistball match at the highest level with long rallies and great saves. Both teams were evenly matched with Germany taking the lead in sets twice. Each time Brazil bounced back and equalized. The game thus went into the fifth set in which the German team eventually narrowly kept the upper hand. “It was an unbelievable game and we are very happy to have again qualified for the final. We now need to regenerate so that we can go fully fit into the final against Switzerland”, said German attacker Stephanie Dannecker after the game. “We discussed tactics beforehand, but could not stick to it for the entire match. I am really proud of my defense, they played really good. Our key player was, of course, Tatiane [Schneider], who, unfortunately, did not have her best day. That happens. We are looking forward to tomorrow. Congratulations to Germany”, said Sergio Muller, Brazil’s assistant coach. His team will play for the Bronze medal in tomorrow’s match against host Austria. In addition to the two semi-final games, we also witnessed the match for the seventh place in the tournament between Italy and Serbia. While the newcomers from Serbia kept in reach in all three sets, the more experienced Italian side kept the upper hand and took the seventh place. In the last set, the Serbian team was on the brink of winning the set, and thus demonstrated again their potential for the future. Argentina and Poland lost their quarter-final matches against Switzerland and Brazil, respectively. They are thus playing for the fifth place in the tournament tomorrow. Furthermore, three matches of the President’s Cup took place featuring the teams of the Czech Republic, Belgium and New Zealand who all played against each other in a round-robin format. The Czech Republic won both its games and thus faces New Zealand, who won against Belgium, again in tomorrow’s final of the President’s Cup. The final-day matches start tomorrow at 1 pm (CEST). The final between Germany and Switzerland will be played at 6 pm. ORF Sport + will already broadcast from 3:50 pm the Bronze medal match between Austria and Brazil.